In Panel A, endothelium-derived nitric oxide was found to relax arterial smooth muscle. A rabbit aortic strip was suspended in a muscle chamber, attached to a strain gauge, and exposed to increasing molar concentrations of acetylcholine (ACh). This led to release of nitric oxide by endothelial cells that acted on smooth-muscle cells to cause vasodilation (left). The strip was then denuded of endothelial cells by mechanical rubbing, and ACh was applied in equivalent molar doses. In the absence of endothelial cells, nitric oxide was not released, leading to vasoconstriction by smooth-muscle cells (right). Panels B through D show the stages in the development of atherosclerosis. 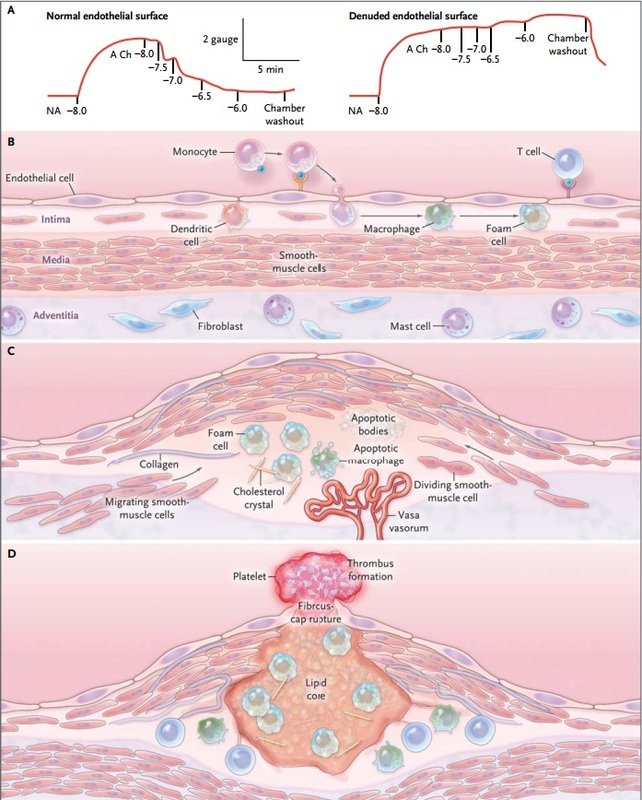 The initial steps include adhesion of blood leukocytes to a monolayer of activated endothelial cells, migration of bound leukocytes into the intima, and maturation of monocytes into macrophages and their uptake of lipid, yielding foam cells (Panel B). Lesions progress as smooth-muscle cells migrate from the media to the intima, the resident intimal and media-derived cells proliferate, and extracellular matrix macromolecules are synthesized. Lipid, cholesterol crystals, and microvessels accumulate in the central region of the plaque, forming a necrotic core (Panel C). Thrombosis complicates physical disruption of the atherosclerotic plaque. Fracture of the cap exposes blood coagulant components to tissue factors in the plaque, triggering occlusive thrombus formation that limits blood flow (Panel D). NA denotes noradrenaline.